2 1 After certain time conjunctions: after/before/when/while/despite/on When I met him, I didn’t like him.  On meeting him, I didn’t like him. (the same time) I spoke to him and then I felt better.  I felt better after speaking to him. 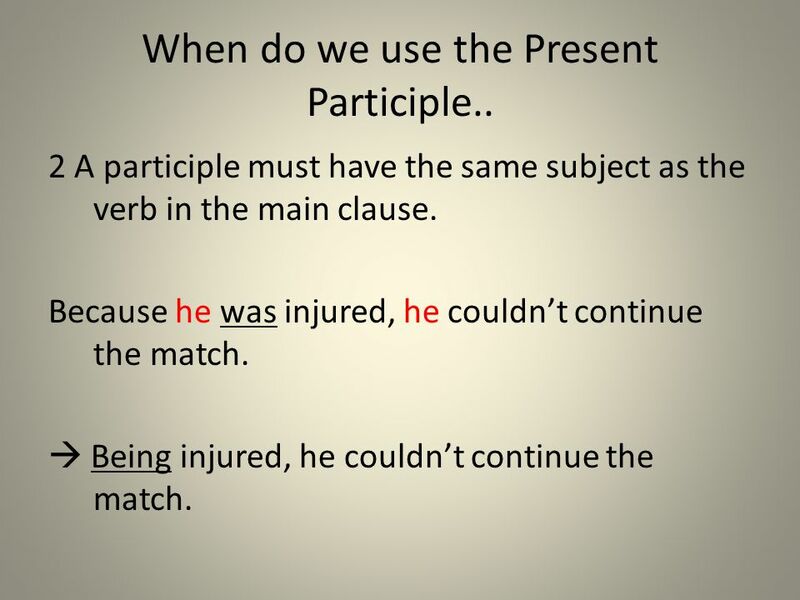 (different times) When do we use the Present Participle..
3 2 A participle must have the same subject as the verb in the main clause. Because he was injured, he couldn’t continue the match.  Being injured, he couldn’t continue the match. 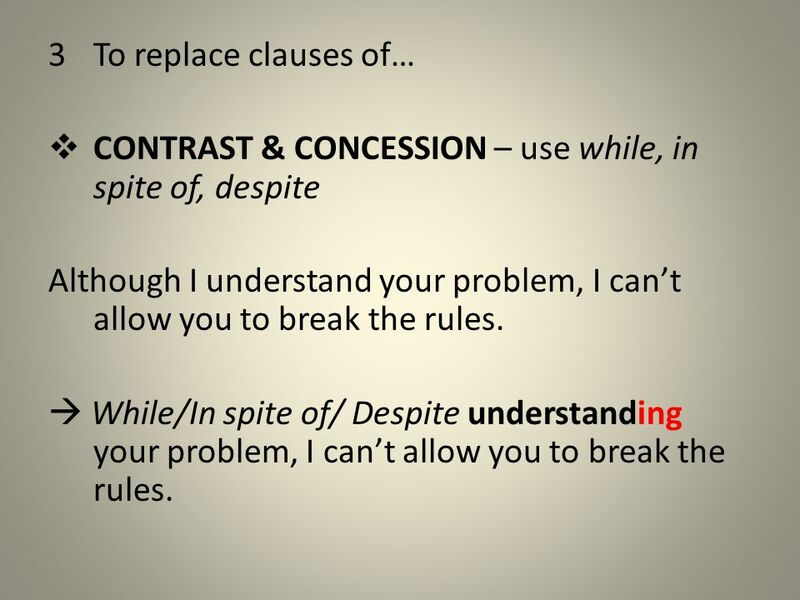 4 3To replace clauses of…  CONTRAST & CONCESSION – use while, in spite of, despite Although I understand your problem, I can’t allow you to break the rules.  While/In spite of/ Despite understanding your problem, I can’t allow you to break the rules. 5 To replace clauses of…  RESULT – the action that comes first is written first. (so+ clause) She was scared of the dark so she switched on all the lights.  Being scared of the dark, she switched on all the lights. …………………………  He left the room, crying. 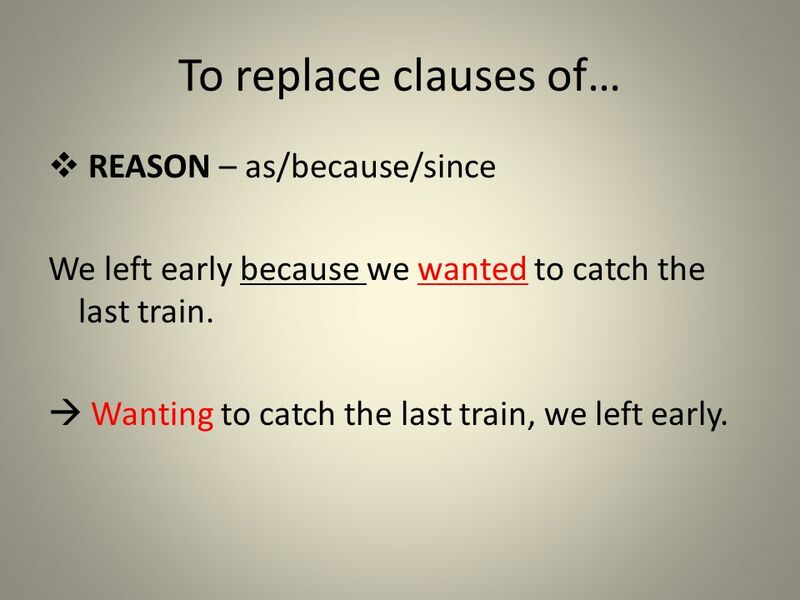 6 To replace clauses of…  REASON – as/because/since We left early because we wanted to catch the last train.  Wanting to catch the last train, we left early. 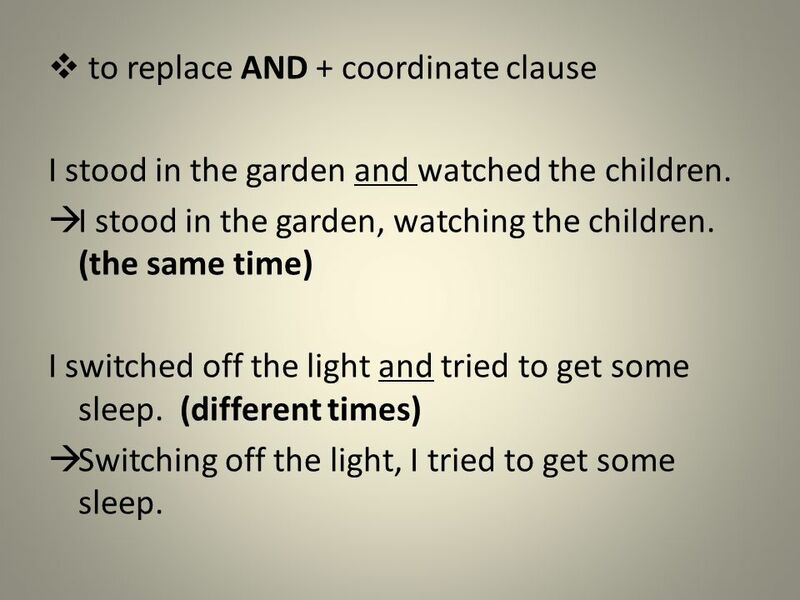 7  to replace AND + coordinate clause I stood in the garden and watched the children.  I stood in the garden, watching the children. (the same time) I switched off the light and tried to get some sleep. (different times)  Switching off the light, I tried to get some sleep. 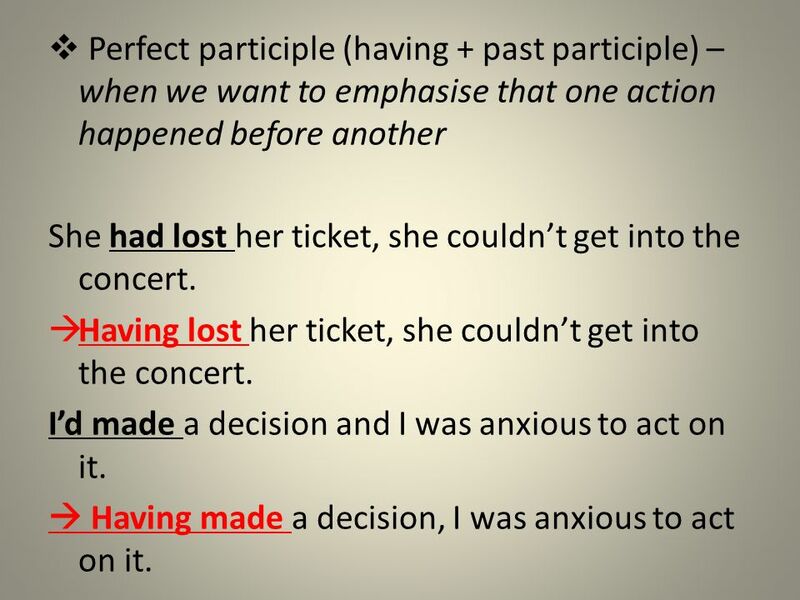 8  Perfect participle (having + past participle) – when we want to emphasise that one action happened before another She had lost her ticket, she couldn’t get into the concert.  Having lost her ticket, she couldn’t get into the concert. I’d made a decision and I was anxious to act on it.  Having made a decision, I was anxious to act on it. 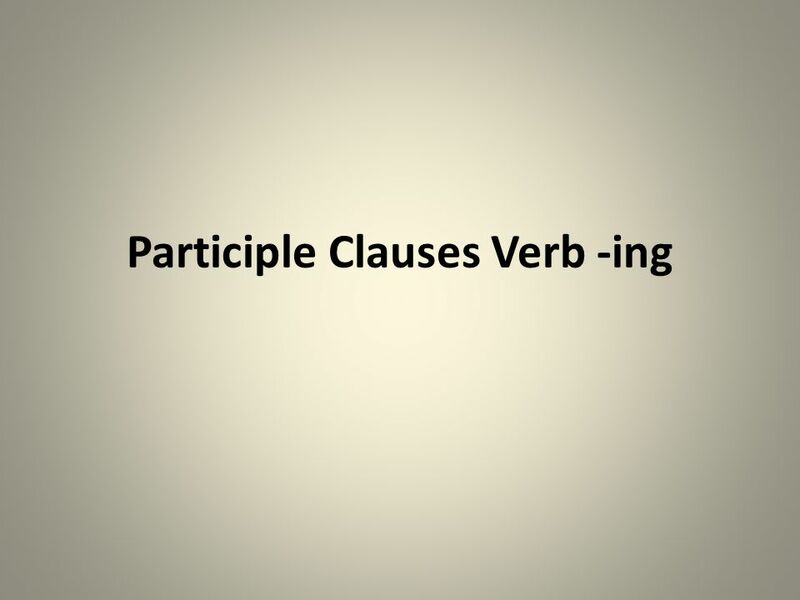 Download ppt "Participle Clauses Verb -ing. 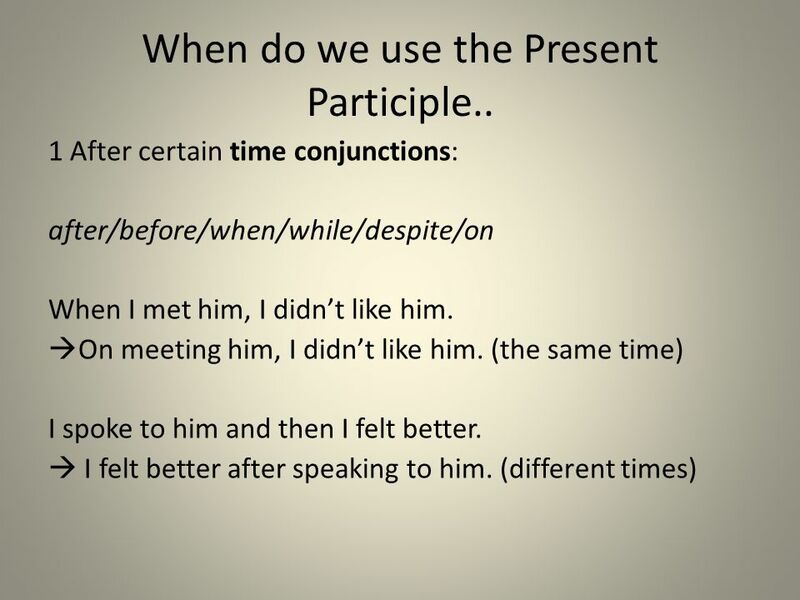 1 After certain time conjunctions: after/before/when/while/despite/on When I met him, I didn’t like him.  On meeting him,"
The Past Unreal Conditional Top Flex 8 Unit 8. Last Saturday, Lucy and Tony had a few misfortunes.They got lost on their way to a wedding. Lucy forgot. Modal Verbs: Present and past possibility. MODALS May, might, can, could. Modals give an indication of a speaker’s attitude and of the relationship between the speaker and the person spoken to. MODAL VERBS INTRODUCTION TO © º E.S.O by Beni Suárez Prado. ABILITY CAN and BE ABLE TO- present We use can or be able to say that someone has an ability Ex. James can/is able to play chess but he can’t/ isn’t able. Although / though + despite / in spite of How to use them.  To refer to the PAST.  To refer to Unreal Situations.  To show that the activity was different from what we wanted.  To say how confident we are. Participles What are participles? InfinitivepastPresent Participle Past Participle boreboredboringbored interestinterestedinterestinginterested Look at. Chucky’s Participle Clauses. Complete the sentences below using the present participles (gerunds) in the box. 1.They spent 3 hours ___________ the fake.